I’ve been sitting on this post draft for a while now – and you’ll hear me saying this often, because I write all the time. Never at a loss for ideas. Writer’s block, Blogger’s block, eh? What’s that? Perfection may be desirable – who doesn’t like the ideal situation – but I think perfection is a state of mind. Whether it is things or people, it is all customizable. Just as we tailor our clothes to our bodies, so we personalize everything we use. We do the same with relationships. Sometimes, to click instantly with another individual, their physical appearance doesn’t even come into the picture. How else to explain the perfect rapport we start certain connections with? And by the time we get to know them better, the short-comings do not matter. They become insignificant. Wabi sabi celebrates the cracked pot, the broken mug, the old cupboard, the dented vessel, that rusted frame. Wabi sabi lets go of the pursuit of perfection, encouraging an appreciation of the simple pure beauty of things as they are. It is about finding beauty in, and embracing the imperfect, the impermanent, unconventional and incomplete. While I am aware of the concept – we experience it all the time – I did not put a name to it until my dear friend Kaarina posted an article on her Facebook timeline several months ago and it stuck in my mind. But what is in a name, eh? Do we not all practice the wabi sabi concept in our lives several times a day? I am thinking, in particular, of my color blindness. I am a rather good seamstress. Early on in our marriage, when my husband’s brown woollen gloves had to be sewn up, I did a perfect job of darning them with bright green thread. At first he thought I was being cute. Then it dawned on him that I had no idea – and that I was happily under the impression I had matched the color perfectly. He teases me about it to this day, but I notice that even though we’ve bought several pairs along the years, it is this pair he always packs and uses. Love. What else? A few months ago, I visited my closest friend in Toronto. In spite of my protests, she made me pack quite a few glass things. She insisted they would all reach safe. So, I did. 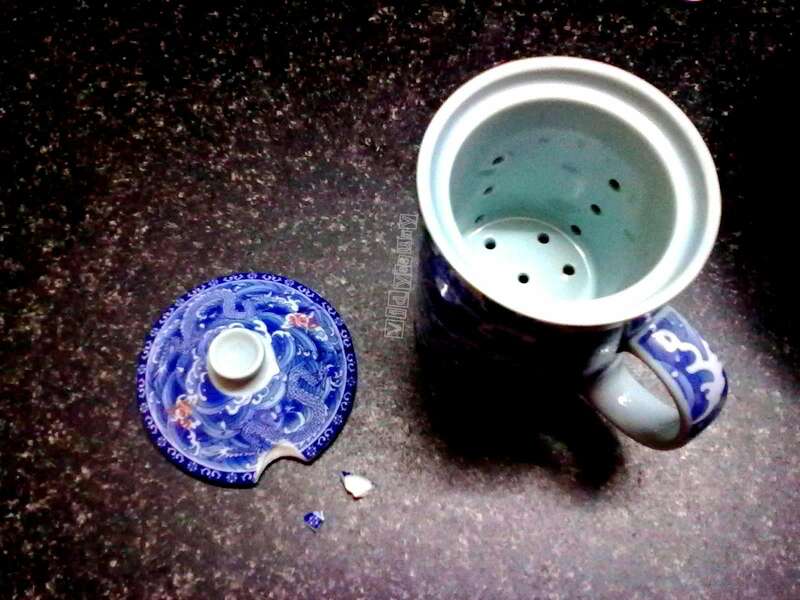 One tea pot that I adored was chipped. I felt quite miserable as I have a thing for this kind of pottery. The next time she called, I told her. She said she had bought another for me, since she suspected this one might not arrive intact – and advised me to turn the broken one into a plant holder. I didn’t. Instead, I stuck the pieces and am using it as a tea holder in my kitchen shelf where I can see it every day. I may not have used it this often if I had to use it only as a tea-pot, because then it would have been sitting on my “special” shelf of things I save up for special occasions. As I run my fingers over the dents on my old silver plate, I remember how my Grandmother ate in the plate, and instantly that memory fills me with love. While cleaning out my old cupboard, I am thrilled as I come across all my son’s “gifts” – imperfectly shaped things, rough at the edges…and all I can see is the love and affection of an eager child. Why, when he broke a cute ceramic cat he quickly stuck it back, slightly out of alignment – and all I saw, after the initial irritation was – how thoughtful of him! We practice wabi sabi in our emotions. Tough situations may break us temporarily, but make us stronger, right? These situations help us appreciate life more. The scars help us face life better as they heal and make us more tolerant through experience. But the happiest example of wabi sabi I can think of is a child beginning to speak. Not perfect, delightful. The best part? We don’t even want to “repair” it, although we enunciate the right way to say the words automatically. Wabi sabi motivates us to live life to the fullest, helping us minimize our inner critic and see the world through new eyes. It is a great mindset to have – humble, simple, mindful. I find it empowering to think that a broken object can not only become usable, but also even more beautiful. Why, being broken can be a blessing. So – on the lighter side, my son asked if not making the bed, messy closet, was wabi sabi. I had to say no. Wabi sabi is looking after things with love, things that are well-preserved like his Grandma’s embroidered handkerchiefs we’ll use until they fray, the utensils we’ve been using for generations with care, those two tablespoons that no longer have a handle, but serve as perfect measuring cups. Wabi sabi is definitely not being lazy. Finally, I believe that we are all works in progress. I am not perfect. But I know I am loved. That is enough. What do you think of wabi sabi? How? Please share in the comments! I am linking up with Unknown Mami, my VIP blogger friend who hosts Sundays In My City. We enjoy traveling the world together. You are welcome to join us! My grandmother once told me, when she taught me to crochet, she knits a mistake into her crocheted shawls. She called it a spider. The reason was two fold. One, to keep her from pride in perfection and the second was to prove it was not machine made. Maybe not quite Wabi Sabi as it was intentional, but still, this post reminded me of her. Mending a pot with beautiful gold is stunning. It looks even more like a piece of art. Wow, this was such a touching and beautiful post elucidating the concept of Wabi Sabi with broken cups and snippets of conversations between you and your son. Loved how you correlated Wabi Sabi with the first few words of a toddler. Very touching post. We must all learn to aim for perfection, but be satisfied with excellence. 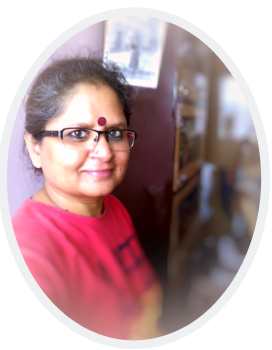 Proactive Indian recently posted…Afraid of perfection! I , myself, am a wabi sabi and I know what you mean when you say, its supposed to be celebrated and not fretted upon. I’ve thought about writing about these pots as well. It reminds me of making a Persian Rugs with a mistake in it. I love the tips that Wabi wabi teaches us. Thank you for this beautiful post with its lessons. Love it! I think when we all let go of trying to live perfect lives is when we find peace within. I know I’ve come to that place – I love my life just the way it is – and I know that you feel the same. I’m cracked – as you well know! Beautiful concept. There’s always some beauty in all imperfections. We all aim to be perfect and when we fail to achieve that we just breakdown. Guess that’s were wabi sabi enters. Love the post Vidya! Aiming for perfection has its drawbacks, but the photographs of your walk are pure natural perfection! Number two: I heard it in several places a thought like this — To fight against the present and what is is to fight against the universe. Everything is what it is right now because the events of the past led to this exact moment. Number three: Thinking of loving people as they are. When it comes to children, I love mine as they are. I don’t expect perfection. I just enjoy that they are “good enough.” They’re “good enough” for me, and that’s all that matters. This post warmed my heart deeply. Thank you. Love this post Vidya. Like Betsy I too am reminded of the story about Persian rugs always being made with a flaw because only God created perfection. 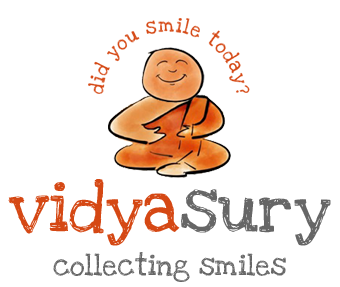 A perfect post on imperfections in life, Vidya:) It is these jagged rough edges that make us the true person we are! This is one of the most profoundly moving posts I’ve read recently. I have never delved into the connotation of wabi Sabi before this,nor did i understand it.And now it strikes me that the best perfection is in accepting the imperfection of the moment.Because this imperfection is also relative to the person defining it.Wabi Sabi essentially gives elbow space for growth to everyone concerned,a “soft landing” for the flight of perfection.Very powerful and very crucial. I’ts like the stuffed toy in my daughter’s closet,which has one eye missing, and in her childish ingenuity,my daughter has glued a shirt button in place of the lost eye.But it looks even cuter! Its not the manner of doing your work that’s as important as your reason behind doing it.The intent behind your endeavour carries deeper spiritual value than the work itself.For centuries mankind has been grappling with the dilemma of the means and the end.However its the intent ,the “why” which is the deciding factor for your personal effectiveness.Is your intention good,do you mean to benefit every one ,including yourself, are you in equipoise during the transactions of life.After all what else determines your happiness,your effectiveness and your personal satisfaction in life? I am back here after a long gap to say that this is a beautiful post. Imperfections. Reminds me of something which I prefer to forget.. Someone is Special recently posted…Few Miles turns 4 today!!! Wabi Sabi tests our ACCEPTANCE.. things will not always be exactly as we want them..the will be what they will. It is up to us to remove our prejudice and see the beauty of things being.. as the want to be.. thanks for this great post!! This is a profoundly beautiful post! What an empowering thought to carry in life… “the piece is more beautiful for having been broken.” The beautiful perfection of life is in the imperfections…the things that add character, uniqueness and special perspective. I learn so much from my flub-ups and often they turn out to be my greatest creations. Maybe now I can start to understand the gift of imperfections! Thank you Vidya for this gift. Vidya, thanks for sharing this. Yet another thought provoking piece!! Indeed This post made my day!! Yes, one need not worry about those broken things in our life instead we can celebrate or rejoice with it and go forward with a renewed strength. 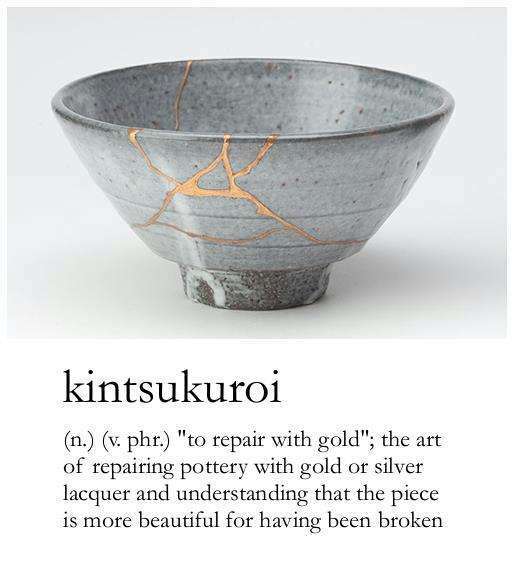 well said and well presented with the broken but lovely pieces of vessels, Thanks Vidya, for sharing this. Vidya my love. Your posts make my day everytime. They relax me into feeling okay about life and things. Wabi sabi is something I will not forget in a long time. Imagine how pretty that pottery looked with strands of random old in between. And how really that tea-pot served a better purpose once it got broken. And so is the case with life, when relationships don’t look or feel perfect they suddenly become important. Otherwise if they are perfect who would take out time to work on them… And the point about us bloggers being connected across the globe through writing… Lovely! I was contemplating my teeth recently, I do it often. I have one front tooth that is crooked, it’s always been that way. Growing up, I never thought of it, it was just a part of me. My smile has often been complimented. When I got older, it was suggested that I have the tooth straightened and I was actually indignant at the thought because well, it just is a part of me and I kinda loved it and embraced it. This crooked tooth never bothered me until I went through a period of insecurity when I was acting. All of a sudden I was convinced that if my teeth were perfect I would be getting so much more on-camera work and maybe it was true as most teeth on-camera seem perfect, but maybe not. This getting my tooth straightened became a huge obsession. So when I was recently contemplating my teeth in the mirror, I realized that I was right when I was younger to embrace my perfectly crooked tooth. I owned it and it was charming. I want to get back to a place where I love my crooked tooth the way I used to. I’m not there yet, but at least I’m not obsessed with getting it straightened anymore. Anyway, that’s what your post reminded me of.